After the previous exhausting day, we slept in late and woke up to a pretty cloudy, overcast morning. 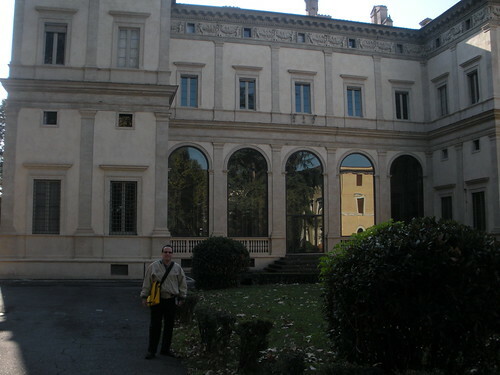 We had nowhere to be until 11am, when we had tickets to visit Galleria Borghese. Closed for many years for restoration, the Galleria is now open to the public but reservations are a must, and entry in timed, limited, 2-hour intervals. Tour books will tell you to make sure to show up a half-hour early but they don’t explain why: as the museum is set up in a former palazzo, it’s not really designed for mass crowds of tourists. The entry/security/ticketing area is crammed into the lower level of the building leading to a mass of three hundred or so people all showing up at once to get inside, and having to stand in three separate “lines” (in loosely defined Italian fashion). First you must pick up your ticket (which takes forever when people don’t believe the signs and ticket-counter people refusing them entry if they haven’t reserved); then you must check all your bags & belongings in at the coat desk; then you have to stand in line once more to actually visit the Gallery. I’d actually recommend giving yourself closer to an hour to get through all of this if you want to avoid anxiety and frustration. Still, we got in at 11 and again followed our tour book’s recommendation to shoot up to the second floor to visit the painting collection first, which most people wait until the end of their 2 hours to do. The Galleria has one of the largest collections of Caravaggio paintings around, so we spent a great deal of time with those works. Also especially notable, though bypassed by many who don’t understand its importance, is Messina’s Portrait of a Man. Messina was the one to first introduce oil painting to Italy, making his work revolutionary, if rarely suitably appreciated because of his Sicilian roots. 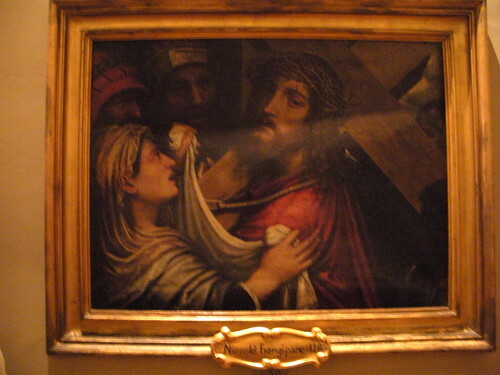 We also spent significant time studying Raphael’s Deposition and Titian’s complex Sacred and Profane Love. From there we headed downstairs to marvel at the sculpture collection, featuring most notably Bernini’s Apollo and Daphe and Pluto and Prosperina. The two-hour visit window ended up being just about right, as we had time to go back to the painting gallery at the end and revisit some of our favorite pieces before leaving. We stepped outside to find that the weather had only gone from bad to worse, the morning’s light drizzle turning into steady, cold rain. 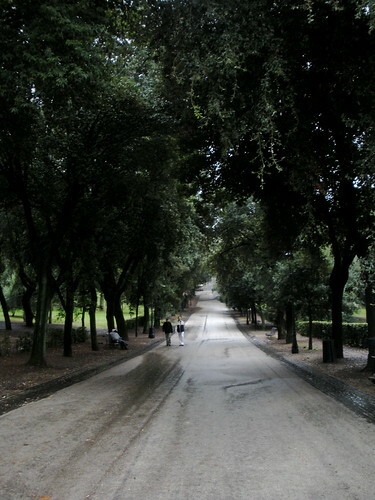 Normally the Borghese Gardens would be a wonderful place to visit and explore, but given it was past lunchtime and we were getting wetter by the moment, this did not seem like a great idea. We left the gardens and started looking for a place to eat, but after wandering about in the rain for a while found we were in one of those darned parts of town that seemed utterly devoid of even simple, basic cafes! Whatever. It was still raining and despite our umbrellas we were getting drenched. 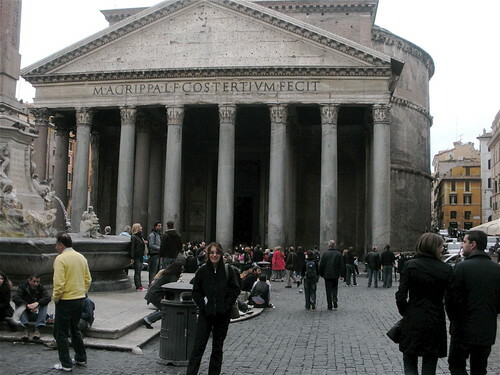 We were also not finding anything that was really appealing quickly, until we dashed in a little place not too far from the Pantheon but off the main track. It was nearly 2pm now so the place was quiet, and we were desperate to eat, so plans for a light pizza quickly turned into a full-blown meal. And what a great meal it was! We had our first genuine carciofi alla guida, which was divine, served with a pizza-sized, oven-charred matzoh. Fennel salad sliced paper-thin and marinated in lemon and oil. Pizza con Lardo, now that vespa was hooked on lardo, and also Spaghetti with an artichoke, tomato and squid sauce that was amazing. As soon as I can find the receipt, I’ll update this post with the restaurant name as I’d highly recommend it. All that food and wine was a well-spent about 70 Euros. By the time we finished, the rain had finally broken up. It was still cloudy and potentially threatening, so we went to the nearby Galleria Doria Pamphilj, another palazzo-turned-museum. This place was insane, with just about every corner of wall space, floor to ceiling, covered in classical artwork. Not always the best painters nor their best works, admittedly, but the overall collection is still highly impressive. I took a couple pictures of the rooms before spotting the no photography sign. Oh well. And then, much to our surprise, I noticed (and vespa nearly walked by) a painting by Niccolo Frangipane! Vespa has been on a quest to see and learn more about Frangipane’s works after acquiring one himself earlier this year. Since we had never seen nor heard of this painting before, it was time for some more covert photography, just for our own records and comparison as the painting and figures bear a strong resemblance to vespa’s own. I wouldn’t be surprised if it features the same models being used. 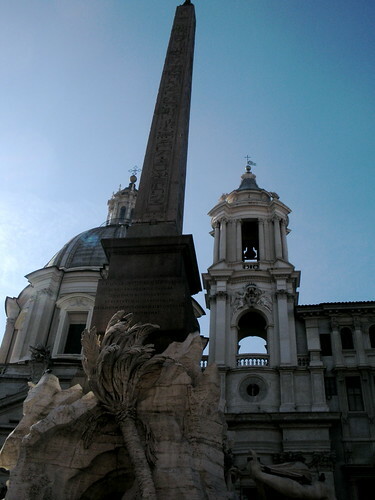 From there, we headed back to Piazza Navona to visit a few churches which had been closed when we’d been by the day before. 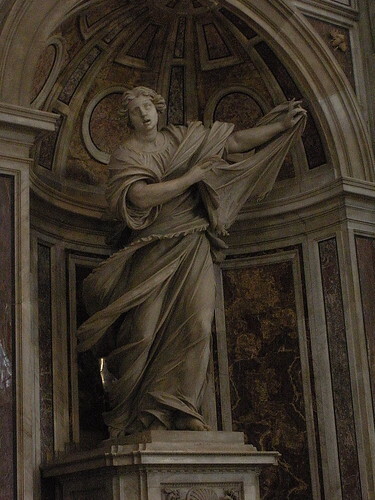 We stopped in Sant’Agnese in Agone, which is most notable for its sculptural and stucco work. We then took a leisurely stroll down Via d. Coronari, a street lined with art galleries and antique boutiques, marveling at the work for sale and resisting some significant temptation. It was getting close to 6 or 7 o’clock and we weren’t in any way really ready for dinner, but we found the cutest little corner cafe to sit and enjoy some drinks and light bar snacks. Cured olives, chips, and canapes were generously brought out by our dancing, grinning, singing host and it was a lovely spot away from the tourists to just sit and relax and soak up the atmosphere. 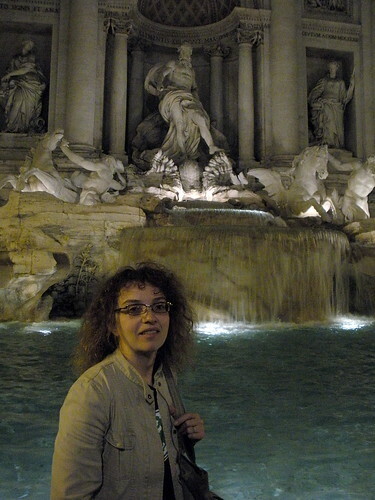 Well rested, from there it wasn’t too bad of a walk to the Trevi Fountain so we could enjoy it all lit up for the nighttime. We sat for some time enjoying the atmosphere and watching the tourists coming and going, along with the guys trying to con them out of a few Euros by offering to take their photos. vespa probably didn’t make any friends with those guys as he started offering his photography services for free to a couple families struggling to get a good shot together. It was still reasonably early, but we were feeling pretty worn down from a day full of art and spent largely wet and cold. So we ended the night with some gelato on the stroll back to our apartment. We had two more days left to fill and not many specific plans in mind…but planning would wait until the morning. Another early morning on Wednesday, though not as early as we had originally planned to get up – exhaustion from the day before had set in. 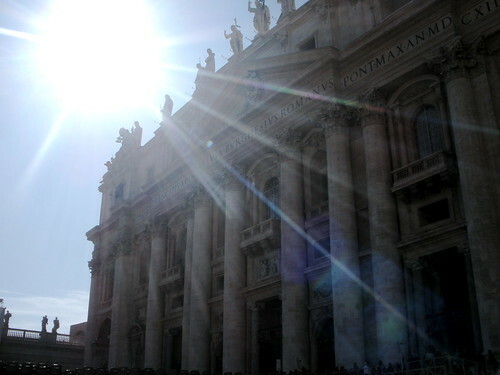 We hopped a taxi over to the Vatican again, this time to the main extrance for St. Peter’s Square. It was 9am and already the place was a mob scene of pilgrims, church groups, school groups, priests and nuns. 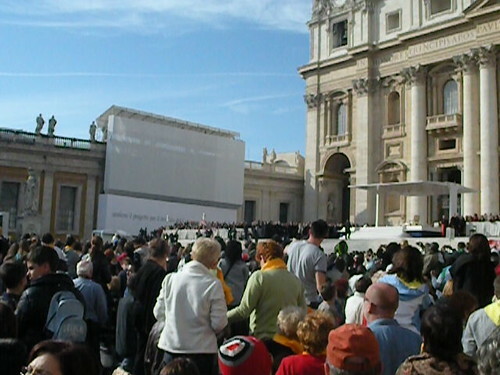 About 7,000 can sit in the Square for a papal audience, and it sure seemed like we’d reach capacity that day. We had our yellow tickets in hand, but it appeared like the guards were too busy quickly checking bags to pay much attention. I really think anyone could get in if you just pushed your way through. We were supposed to try to pick up our “special tickets” again, so vespa went off on that mission, only to discover the hand-engraved ones could not be found/were never finished. Oh well. He was given another envelope with our name on it instead, though we made the mistake of not opening it until we’d already found our seats among the masses. Inside were two RED tickets, not yellow ones, and they said “Special Ingresso”. Would this have gotten us some kind of preferred seating, we wondered? Oh well, too late now. As it was, it was kind of fun sitting where we did. In front of us were a church group from Kansas and another from Germany. Behind us were a group of parishoners and nuns from Poland. To my right sat an elderly British gentleman and to our left a group of Italian boys from Genova. We had about an hour before the audience was to begin, and our main mission at that point was figuring out how the pope would arrive. Should we have chosen a seat more near the middle, or were we good off to the right side? We weren’t sure, only that the popemobile had to show up at SOME point and we wanted to get a look! People were standing on their chairs to get a better look while others were yelling at them for doing so. I got up on my chair just to try to see where the popemobile was — and sure enough, it looked like it would be making a turn right near where we were sitting! We were only 4 chairs in from the outer barricade, and people started going nuts as the car made its slow turn to come down the side. vespa at that point knocked me OFF my chair to get a better view himself! When I was able to rewatch the video, I was surprised how fast it actually drove by, as it seemed much slower at the time. The pope was smiling and waving at everyone in the crowd, making as much direct eyecontact as he could (vespa claims I blushed. I might have. 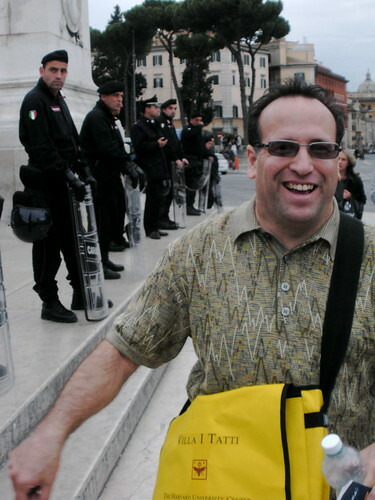 It’s a weird experience and hard not to get swept up in the moment; as vespa said, this is the man who is perhaps the leader to the greatest number of people in the world) and vespa let his mom know exactly when the pope passed us so she could say an extra blessing. After looping around the crowd, the vehicle slowly drove up a ramp to the main stage for the official audience to begin. Mostly, a papal audience boils down to one thing: different groups of people being acknowledged by the pope. The pope first read a long message in Italian to the audience. Then in turn a German, Polish, English and Spanish-speaking bishop took the stage to announce “special” visitors there in the audience. It was fun as each of the groups would have their name called, to see them jump up and shout, cheer, sing, or wave banners as the pope looked for them and waved. Some of the Polish groups were definitely the loudest and most enthusiastic and I enjoyed being among them, given my own heritage and knowing how much that side of my family was deeply Catholic. The Pope then read another short message in each language, there was a little more ceremony, and then a final blessing over the crowd and for any holy articles (rosaries, etc) people had brought. The whole thing was over a little before noon. The crowd began to pour out onto Via della Conciliazione and we wondered what we should do next. Food seemed like a good idea, but we wanted to get away from the crowds. 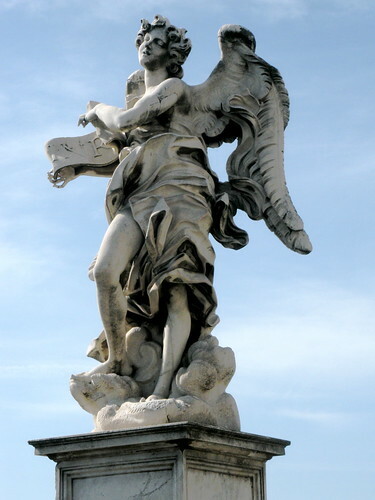 To do so, we walked towards Castel St. Angelo to cross the legendary “Bridge of Angels”, where I took a lot of photos of the beautiful sculptures along the walkway. Not far across the bridge we managed to get away from the crowds and found ourselves in a charming little artistic district. Painters, mosaic artists, marble-cutters all had tiny shops and we found ourselves at the delightful Osteria Le Strenghe for a leisurely, excellent lunch. Fried zucchini blossoms stuffed with cheese and anchovies; bruschetta con lardo; excellent pasta — this was some seriously authentic Roman dining! A place I’d gladly return to on a future visit and recommend wholeheartedly. Full and rested, and glad for the peaceful respite, we decided to spend the rest of the day hitting some more of the main sites we’d missed so far. 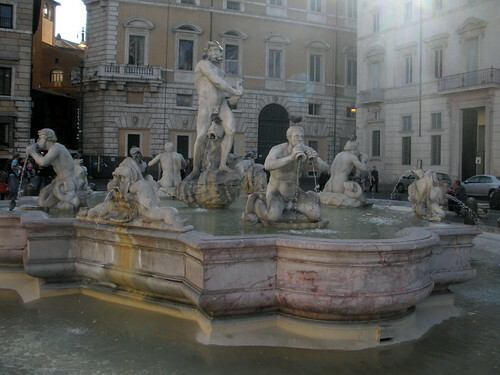 We started at the nearby Piazza Navonna, another ancient Roman Circus. 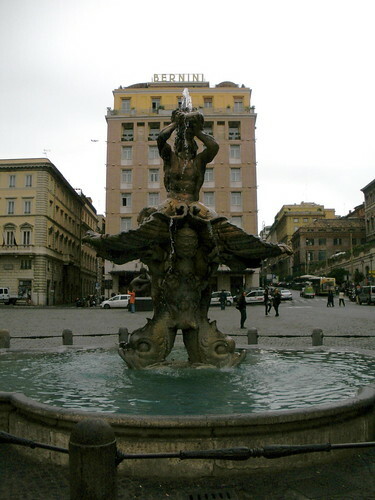 Street artists and eager cafe hosts fight for the tourists’ attention, but the star of the show is Bernini’s fountains. We sat for a while and enjoyed, and also checked out a few nearby churches. 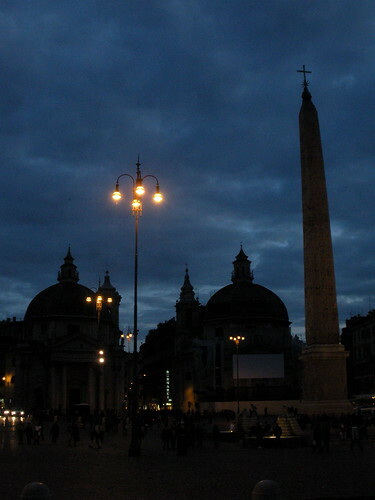 From there, we decided to head over to Via del Corso and up towards Piazza del Popolo. Corso is a serious retail street, so we did a fair amount of window shopping as Romans began to hit the streets for the traditional evening passeggiata. I often felt woefully under-dressed in Rome, and seeing everyone wearing their best for the nightly walk only increased that feeling a hundred-fold! I did make note of a little leather shop on our stroll, though, that seemed to have some nice jackets for sale at good prices. We made it to the Piazza just about sunset. 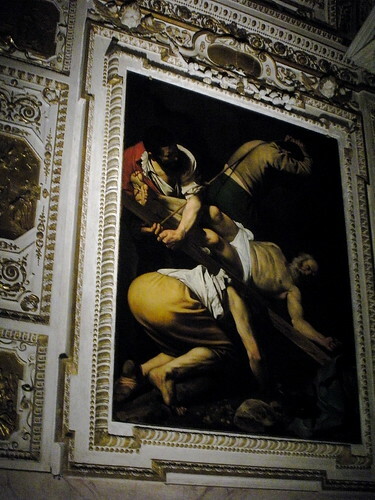 There, we ducked into a couple of churches to check out the artwork, notably the Caravaggio at Santa Maria del Popolo. In Santa Maria di Montesanto we sat for a few peaceful minutes enjoying the evening chanting of monks. 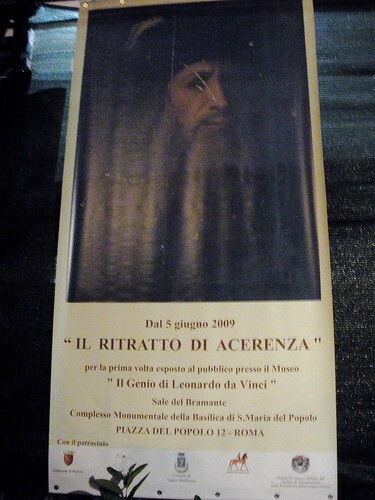 We also stumbled upon, much to our surprise, The Genius of Leonardo DaVinci” at Chiesa Santa Maria on the Piazza. I had seen a version of this exhibit a couple years back in San Francisco but vespa never had and is a diehard DaVinci freak. We managed to get in and spend some time checking out the fun exhibits based on DaVinci’s machines and inventions. Most notably, and what I had NOT seen before, but the exhibit was temporarily showing the Acarenza portrait, a recently discovered work of art believed to potentially be one of the only portraits ever made of DaVinci during his lifetime. Who is the artist? 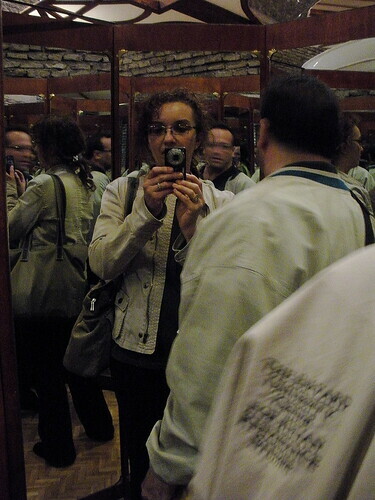 (Could it be a self-portrait, even? A newly-found DaVinci?) The real thing or not, it certainly makes for quite a mystery and we spent a lot of time studying it, trying to decide for ourselves. 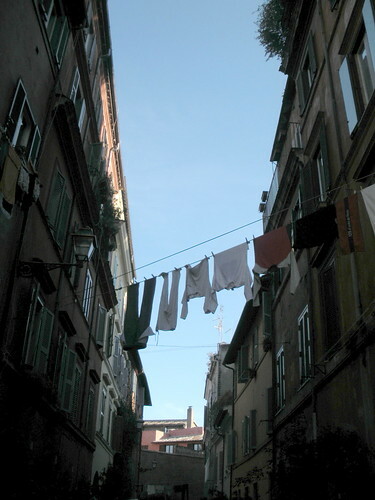 From there, we headed back down Via del Corso. We sat for a few minutes at the bottom of the Spanish Steps, people watching and fighting off guys trying to sell us roses. We figured we should get a “light” dinner at that point, but were too tired to search around too much. We ended up in a place not too far away from our home base near Via Veneto. This turned out to be one of our most expensive meals of the trip (with the location, not surprising), not necessarily the best, although I will say that vespa’s chicken cacciatore was outstanding and that’s normally a dish I hate (my grandma made it way too much when I was younger. But I would have had no problem eating this version on a regular basis.) 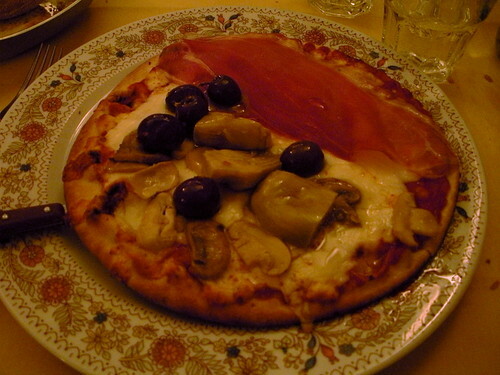 I had a pretty decent pizza capricciosa…what I liked best about it was the olives had been well-marinated in red pepper flakes and were extremely tasty. Mmm, olives. 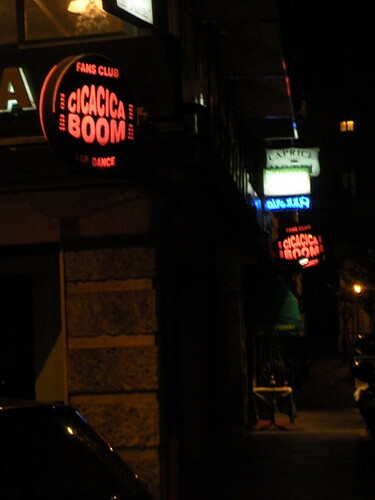 Extremely full and extremely tired from what was somewhere near 4 or 5 miles of walking that day, we found our way home by looking for the Cicacica Boom sign, our beacon of light on the dark streets of Rome. Full Day 5 photoset here. 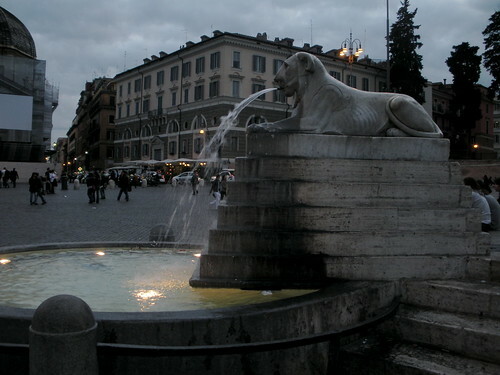 I’m half-way through my day-by-day Rome report, so I thought this might be a good time to summarize some overall travel tips for the city, as well as the country as a whole. Buy/bring several, and try to read what you can before you go. I strongly recommend Rick Steves’ guides (and videos) for great practical tips, and Eyewitness Travel for more in-depth cultural/artistic information. A Streetwise laminated map is a must. Pick up other travel guides as best suited to your interests. Every guide has its strong and weak points, so it’s good to have at least two different ones on you at any given time, depending on what you want to see. 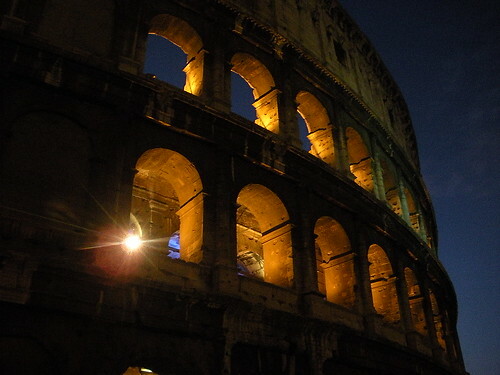 A Roma Pass is an absolute must if you want to visit certain sites like the Coliseum without waiting in endless lines. Just buy one in any Tabacchi shop. 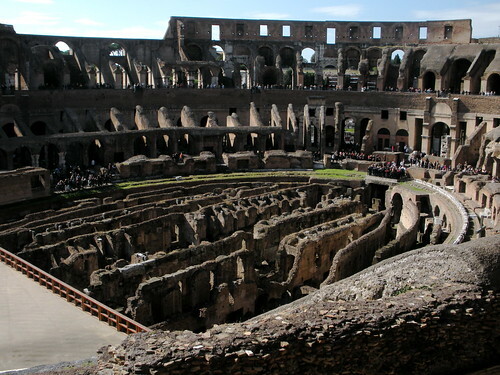 It’s good for three days from your first use, and for 23 Euros will get you access to two sites or museums (including combined Coliseum/Forum) inclusive, plus 30% discount at other sites, and included bus/rail useage, for three days. Worth it alone to avoid the ticket lines at the Coliseum!!! 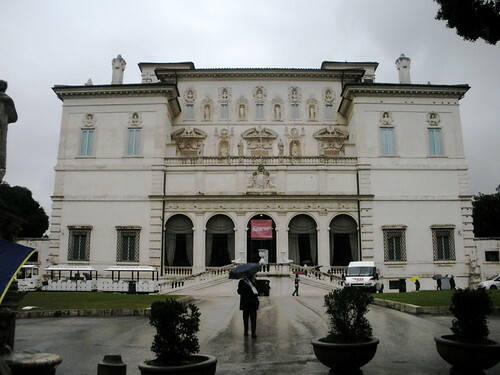 Rome has many sites and museums you absolutely must reserve in advance if you wish to see, such as the Galleria Borghese and the DeChirico Foundation Museum. We lucked into getting access to the latter without reservation, but at the former we saw angry people being turned away because they didn’t reserve. 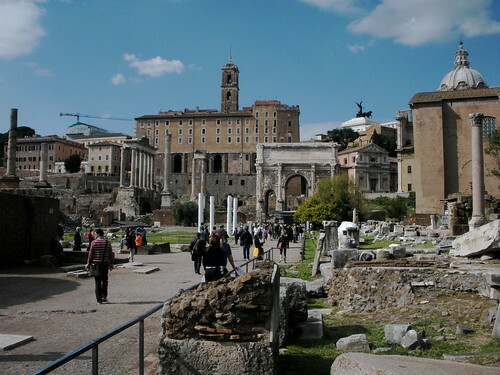 So plan your Roman itinerary in advance where you can, as there is so much to see, and some of it must be booked before you arrive. If possible, wait until you arrive before exchanging money. You’ll do better with rates withdrawing Euros from Bankomats (aka ATMs) than through exchange services stateside. (I couldn’t avoid having to make some withdrawls in advance as I needed to pay for my apartment rental in full, in Euros, upon arrival). Call your credit cards and banks before you go, to alert them you will be traveling abroad, to avoid surprise limits and restrictions on usage. * As a sidenote to the above, make sure that the cashier sees that you are standing and not sitting, as a touristo. I nearly was charged double one morning as it was assumed I’d been sitting when I hadn’t. 2 morning cafes and brioches should not cost more than about 5 Euros…check your bill if you’re being charges more than that and you’re standing at the bar…. 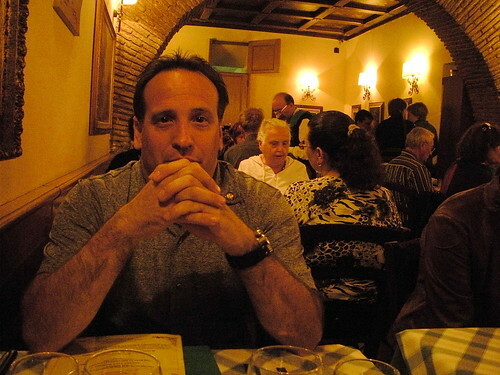 * That said, paying a little extra to sit and enjoy an afternoon aperitif is almost a must. Most bars will serve you at the very least some chips and nuts if you show up late afternoon, sit and order a round of drinks. More generous places will throw in cured olives and/or canape sandwiches, often at no more than 4-5 Euros a drink. This can easily make for a filling (if boozy) light dinner if you’ve eaten a large lunch! And it’s a fun way to really feel like you’re going “native” if you find a good local bar to hang out at. 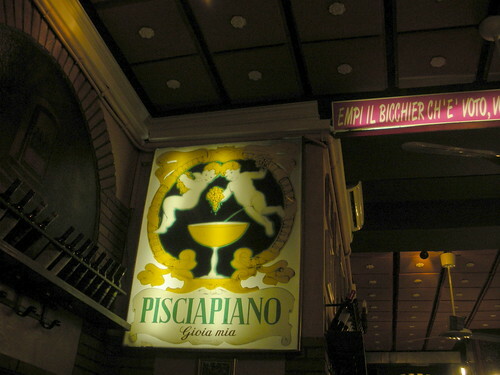 Both in Rome and Venice I’ve greatly enjoyed the bar culture as a hangout/relaxation point between say 4-7pm. 1. Avoid places directly near/on main tourist attractions. That is, if you must sit at Piazza Navona or the Pantheon in a cafe, do so to order one expensive drink for the experience. Don’t expect to get good food or good value for your dollar doing so. 2. 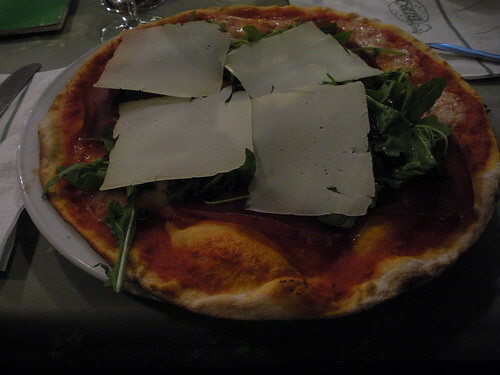 Avoid places with pictures of food on the menu or multiple language translations per page. That just screams tourist trap. 3. Avoid places that try too hard to coax you inside or to have a seat. If they have to push so hard for your business, there must be a reason. 4. Stick with “vino della casa”, either rosso (in Rome, the default, usually Montepulciano) or bianco (not all places in Rome will have it though Trebbiano is what you’ll likely get if available; in Venice, it was more the default as a Tocai). Unless you’re a wine snob, the house wine is likely to more than meet your needs for the night. And be a lot more affordable. 1. Places on little side streets and out of tourist districts, away from the main tourist trade. 2. Places with no “menu touristo”. 3. Places with the menu strictly in Italian. You may struggle a bit in deciphering it, but study a little Italian before your trip to at least learn the basic standard dishes of the region you may wish to sample. In Rome, not a bad choice as the city is so huge, and you can get most places you want to fairly quickly for under 10 Euros. However, do be cautious of some who will try to con you. Have small change/bills handy before getting in a cab, speak at least a few necessary phrases in Italian (“is here”/”is there”/”to the left”/”to the right”), and have some sense of where your destination is located so as not to be driven around in unnecessary circles. Drivers may try to intimidate people they think do not know better, so point out your specific destination on a map or hand the driver a card with the address/number printed clearly if you don’t think you can state it in Italian. 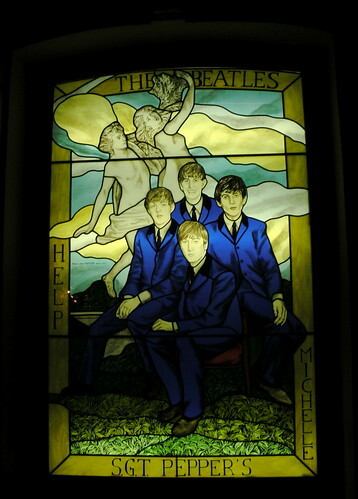 Many churches hold some amazing collections of art. However, be aware that their hours of visitation may be limited. Many may only be open in mornings, 9am-noon, and then later afternoon (4-7pm). Some may also disallow tourists during service hours (often around 6pm). So if you want to visit particular churches, keep these restrictions in mind when planning your daily excursions. Tuesday morning and we’re up at 6am as we’ve got a date set at the Vatican Museums. vespa, as a member of the Patrons of the Arts in the Vatican Museums, has secured us a special visit to the collections and we need to be there at 8am. We’re not sure exactly what we’re going to get to see, beyond having requested a chance to visit their art restoration labs. vespa is hoping since our time is an hour before the general public is allowed inside, we might get to see the Sistine Chapel before the crowds descend. But we have no idea. All we have is an email printout with our names and the name of a person on-site we are supposed to be met by. And that we need to go to the exit door, not the main entry of the museum, to find her. So we get a cab (who takes us right to the PROPER location) and get there about 7:30. OK, we’re early, but we see guards already there, along with a few regular visitors starting to form an entry line already. Email in hand (and our Patron pins on our lapels), we start walking towards the guards, even as their waving at us to get in the regular line. “No no no, Patrons! Special appointment!” But they don’t want to hear anything about it. We show them the email, but they don’t read English. More waving and insisting to stand over by the regular entry line. This is getting frustrating. And potentially dangerous? So we start giving names. The first name gets a pause out of one of the guards, but still insistence that we need to stand to the side. The second name finally ends up being the “secret password” to get in. Suddenly one guard snatches the email from our hands and waves us to come to the door. There he is interrogated by another guard before we are let inside, there is a lot of furious discussion in Italian with some other officials inside before we are told to “stand right there and wait!” until the proper person shows up to take us around. Which is fine. At least we’re inside and we didn’t get arrested. We get to watch the comings and goings as the Vatican Museum prepares to open for the day, which is an interesting site all of its own. Finally we are pointed down another corridor, then to the Special Passes ticket window, where we wait for our guide from the Patrons to meet us. She is there by 8am and we are quickly through security and being led quickly through the corridors of the museum, deserted and chilly in the morning air, to one destination: “You would like to see the Sistine Chapel first, yes?” Yes! Trying to describe the experience of walking into the chapel that morning, with literally no one else there except for a few guards and a handful of other special guest visitors with other guides, is rather indescribable. vespa may have uttered a few words not entirely appropriate for such a holy place, but I think one should be forgiven when struck by such a site. Our guide told us to please enjoy and take it in ourselves for a time, and when we were ready she would give us more of a tour of the chapel. 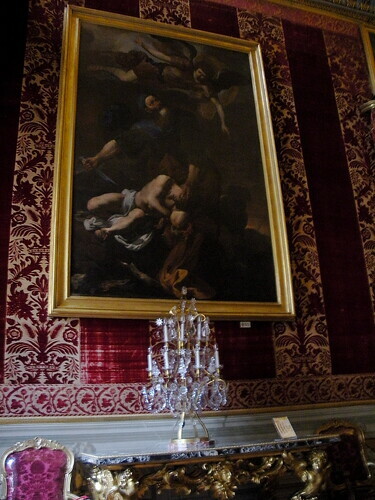 The only thing I wished for, as provided in some of Venice’s great palazzos with tremendous ceiling panels and artwork, were some mirrors to be able to fully study and appreciate the work without straining the neck. We were then treated to a very informative discussion and tour not only of Michelangelo’s ceiling frescoes and Last Judgement, but also the works by Raphael, Bernini, and Sandro Botticelli that decorate the walls. 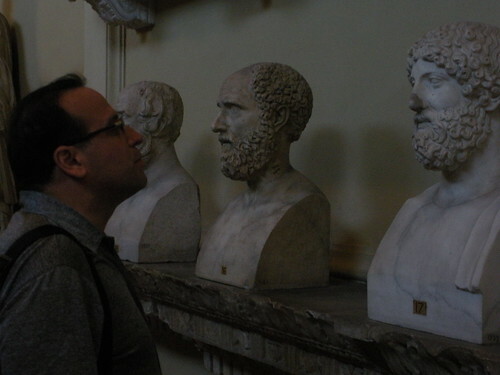 vespa had plenty of technical fresco questions and learned some surprising things about Michelangelo’s technique. As for the debate over the cleaning of the frescoes? I have to stand by the position that no, they were not over-cleaned. To go into that in more detail would necessitate a long discussion of “buon fresco” vs “a secco” work, but I do believe that Michelangelo only worked “buon fresco” so stripping away any layers added beyond that was the correct thing to do. We stayed in the chapel with all of maybe 20 other people until the general public was just beginning to stumble in (advice to future travelers: If you want to see the Chapel without the crowds? Line up as early in the morning as you can to get in the Vatican Museum. Have a map of the museum handy with a clearly marked path to the Chapel (it’s a LONG walk) – Rick Steves’, again, has a good map for this. As soon as you are through the doors, bypass EVERYTHING to get to the Chapel as you can go back at your leisure to see the rest. Because if you really want to appreciate the Chapel, you need to do so before you are in a mass of hundreds (if not thousands) of others, unable to move about freely or really stop and pause to appreciate the work. After that, our guide lead us to Raphael’s Rooms, which again we had the chance to enjoy and study before being jammed in with massive crowds. These rooms feature beautiful frescoes with intricate stories to tell, well worth reading about before visiting (or at least, having a wonderfully educated guide as we did). After we finished there, we headed down the Map Room, where I paused to take some photos in front of the one featuring my “home town”, Ancona. 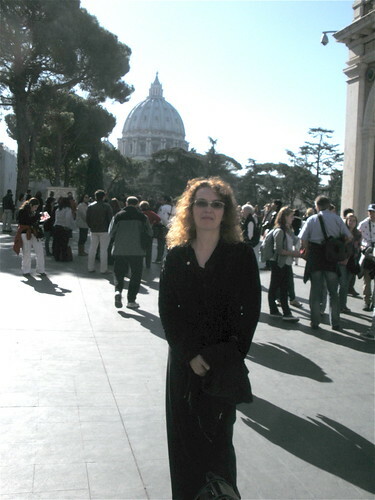 We were then taken outside into the courtyard to visit one of the current restoration projects taking place, sponsored by the Pennsylvania chapter of the Vatican Patrons. 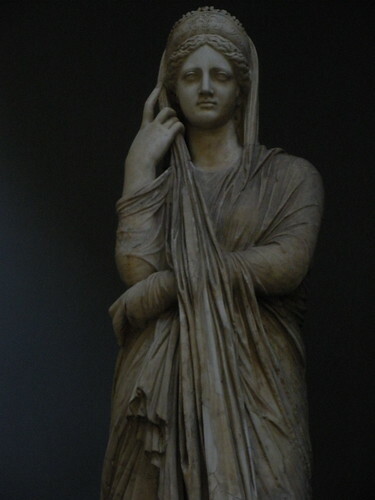 It was fascinating to learn about the work involved in restoring two ancient marble statues, replacing old restoration work that was causing more damage than good. After that, we got word that we would indeed be allowed to visit the painting restoration lab! This was a really amazing chance to see restoration work up close, from removing old varnish, in-painting missing sections of paintings, stabilizing panels and also repairing frames. We spent about a half-hour observing work being done on about a half-dozen works before our guide had to leave us to finish touring the museum on our own. We took a quick early lunch break at that point, and then completed touring the rest of the museum’s collection of paintings (not terribly impressive, although their modern religious art wing actually had three Salvador Dali paintings I’d never seen before) and sculpture (much more impressive). 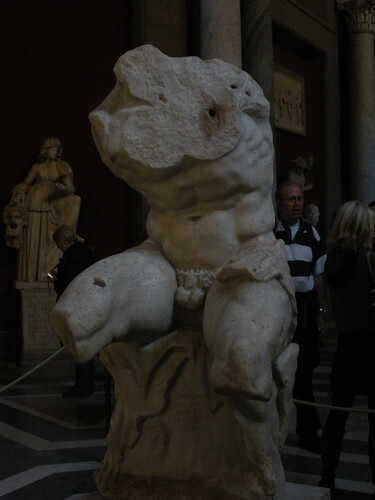 We saw the legendary Belvedere Torso, for one, and I found that my appreciation for sculpture as an artform expanded dramatically that day. I just don’t think American museums have anywhere near the quality – let alone quantity! 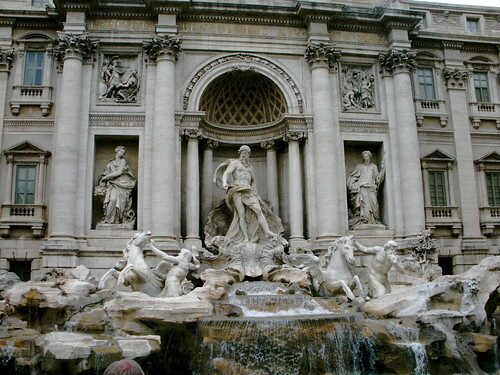 – of classical sculpture works that Italy does. The collection here was simply staggering. We finished up at the museum in early afternoon, but had to hang around the area as our passes for a papal audience the following morning were to be picked up after 3pm. 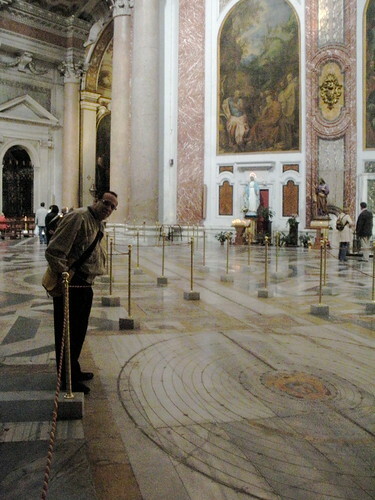 So we headed over to St. Peter’s Basilica, which is more impressive for its size than for its interior artwork. 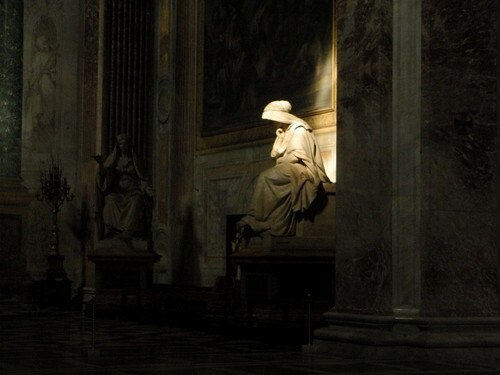 Still, we did get to see Michelangelo’s Pieta (now sadly behind glass) and visit the Vatican grotto, most especially to visit John Paul II’s tomb. 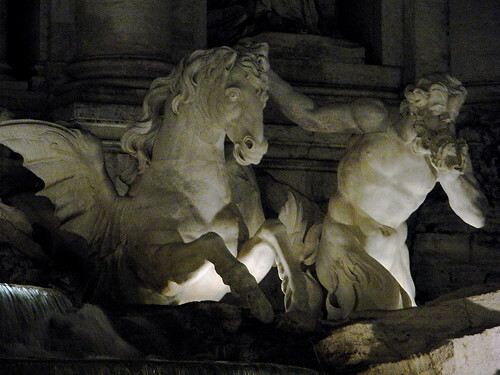 Which was the first sight in Rome to move me to tears. At the appropriate time we attempted to pick up our tickets, however there was still some confusion as our “official” invitation was not yet ready. But the Swiss Guard was happy enough to give vespa two regular passes, so we were set for the following day, which would be another early morning! 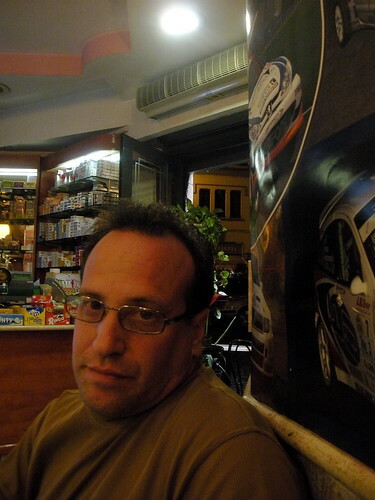 Tired and rather “art-ed out” at that point, we hopped a cab back to Trastavere to do some more exploring, chill out with some early evening drinks at Aristocampo’s little panini cafe/bar, and then seek out someplace new for dinner. The place I really wanted to try on several recommendations sadly was closed on Tuesdays. Woe! But we wandered about until we ended up at a place vespa had noticed the night before and thought looked good. I can’t recall the name now (if I can find a receipt I’ll add it later). This place was bigger and more “touristy” than the previous night, but the food was still excellent. Monday morning we managed to get up at a reasonable hour thanks to an early night’s sleep. 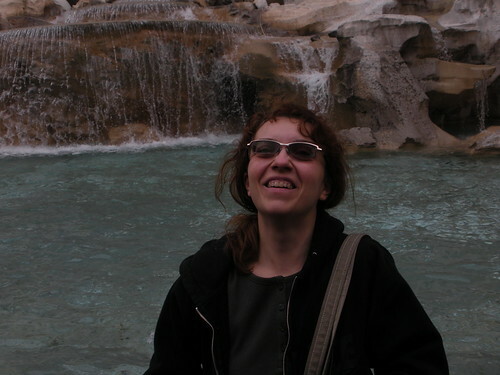 Freezing in the shower, though – there has to be SOME way to turn the hot water up but we can’t figure it out just yet. Most of the museums are closed today so I say it’s a good day to do the ruins. 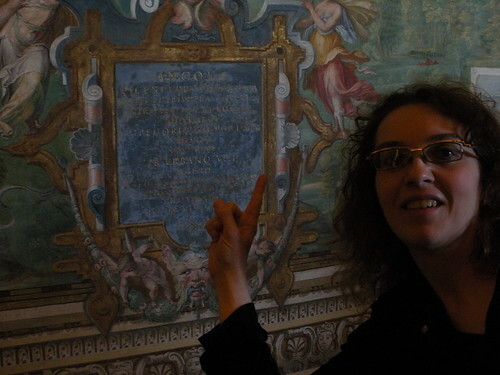 Vespa wants to hit one other site first–Villa Farnesina, which supposedly houses some fabulous frescoes. So after a quick cafe and bite at Bar Ludovisi right across from our apartment, it’s off in search of a taxi as it’s a bit of a hike from our location and we figure we’ll be walking a lot later on. Thus began our first questionable taxi adventure in Rome–and a lesson learned about being very specific about our destination. I’m thinking that the route the driver is taking does not match the way I think we should be going, but my understanding of Rome’s geography is not that great yet. Needless to say, however, that both vespa and I realize something is rather wrong when instead of ending up in Trastavere where Villa Farnesina is located, the driver wants to let us off at a big official looking building near the Olympic stadium in Northern Rome. “Farnesina!” he tells us, even as we’re shaking out heads no. Apparently “Farnesina” also can refer to foreign embassy, or so he tells us in very broken English. Finally I hand him our map and point exactly at where we wanted to go. He stares at it for a long silent minute, then says nothing as he starts the car up and heads off in the PROPER direction. Anyway, we’ve finally made it to our proper destination and are rather pleased to find very few people there besides one large tour group from Germany. 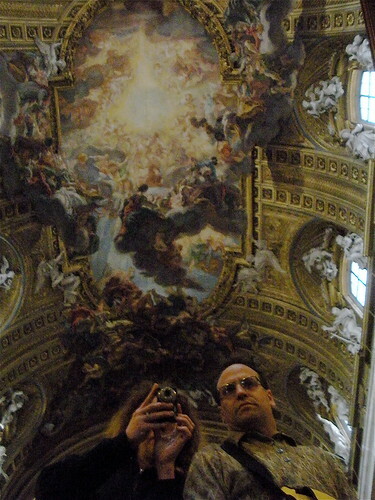 We dash around room to room ahead and then behind the tour groups to appreciate the frescoes on our own. Our favorite is the “Perspectives’ Hall” by Baldassarre Peruzzi, a wonderful trompe-l’œil which only works properly when you stand in one particular spot in the room–and it’s NOT the spot the tour guide thinks it is! Tour guide gets visibly annoyed when vespa starts pointing out to the German tourists where to stand to get the perspective correct. The room is also amusing for the ancient anti-Catholic graffiti scrawled on one wall many centuries ago and left there for historical purposes. 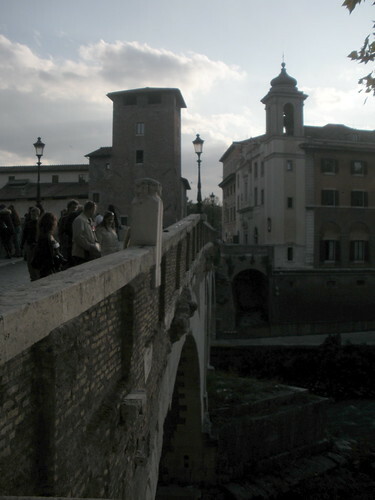 After we finish up, we take a short stroll around Trastevere, deciding we’ll need to revisit later. 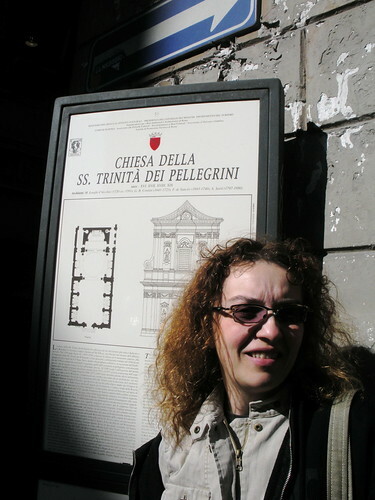 We’re close to one church I wanted to visit for the name alone: Chiesa della Santissima Trinità dei Pellegrini. 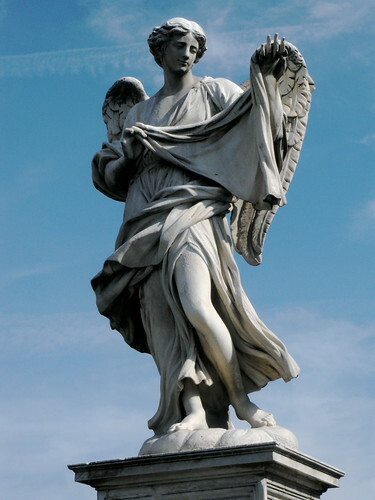 (Pellegrini is “pilgrim” in Italian, and with all the religious pilgrimage sights in Rome, there a lot of “Pellegrini”-sightings to be found…) So we cross Ponte Sisto bridge and end up in another charming neighborhood full of jewelry stores and tiny specialty shops. Sadly, the church is closed for renovations, but we are able to get some photos from the outside. 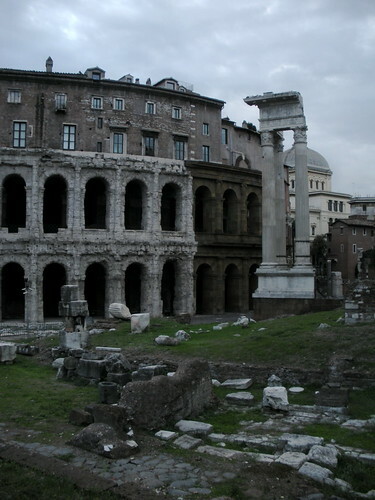 From here, we decide to head over to the ruins, though we’re not sure which to hit first: the Coliseum or the Forum. We had bought ourselves Roma Passes on Rick Steves‘ recommendation, and had only used them once at the Museum yesterday. He recced saving one of the other free admissions for these sighs to save money (and avoid lines), so that was our plan. 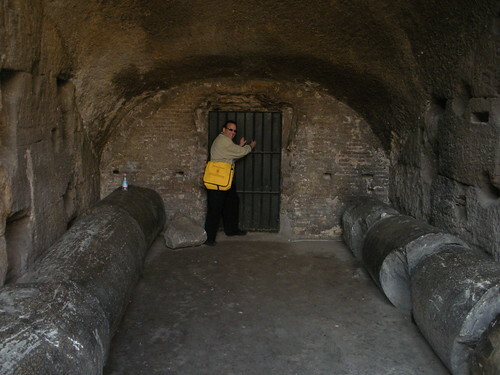 Of course, we hadn’t planned on being frustrated on how to actually get IN to the Roman Forum! 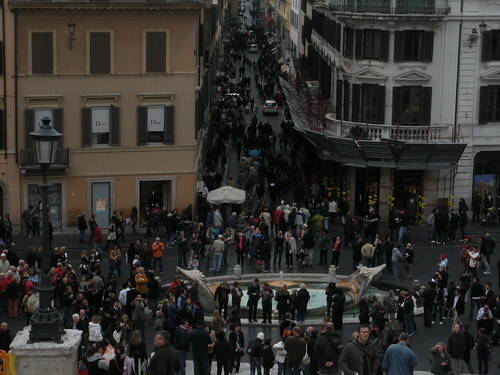 We found some neat vantage points over it up on Piazza del Campidoglio, but no way inside. vespa was getting frustrated and we were both getting hungry, so we decided to hit the Coliseum first after another gelato break. Looking through Rick’s book, we also finally found out how to get IN the Forum along Via d. Foir Imperali, but that would wait for now. I’m allergic to being herded around sites and museums in groups to begin with, and the whole thing just seemed kind of dodgy to me. We waffled for a minute or two before I said no, I didn’t want to do a group thing, we’ll figure it out on our own. As we were walking away the guy was yelling after us, “How about both of you for 8 Euros? 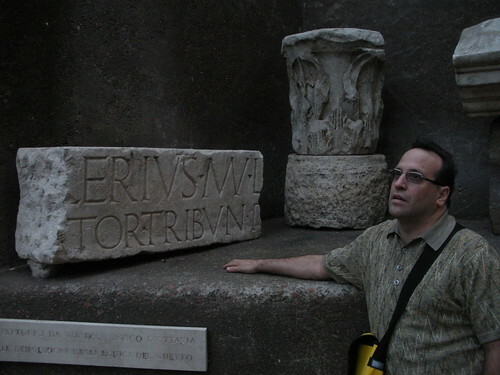 !” Later I looked up in Rick’s book and sure enough this is a big scam around the Coliseum: they’ll take your money, tell you to stand in a particular spot with a group of other suckers for just a few minutes…and no tour guide ever shows up. Or if they do, they run you through the Coliseum and then disappear before taking you over to the Forum. After the Coliseum, we went right over to the Forum, again bypassing the ticket line with our Roma Passes (SO very worth it even if you just use it to bypass lines at the big sites!) 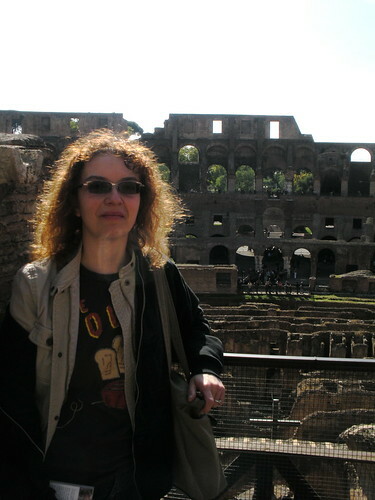 And…let’s just say the ruins in the Forum hit me. Big time. I don’t know if I can explain why. I didn’t think I’d give that much of a hoot for the ancient ruins, being more of a Renaissance art person, but…the sheer magnitude of these ruins was just mind boggling. Also thinking about the figures through time who had walked these paths, lived, prayed, worked and created history in these buildings…it all gave me the shivers. And I took a crazy number of photos. 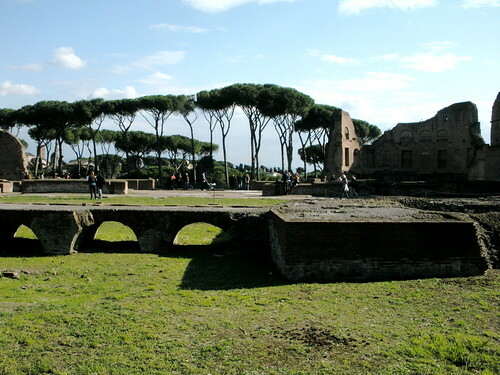 Just when we thought we’d covered most of it, we climbed up one path that lead us up to Palatine Hill and yet MORE ruins. 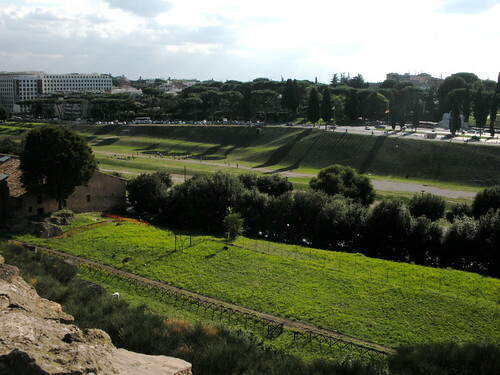 We wandered about, took even more photos, looked down over Circo Massimo (wishing I had my ipod and my Ben Hur soundtrack on me! ), then were ready to collapse from exhaustion and mental overload. Time to find somewhere to sit and have a drink, maybe a light bite since it was only about 3:30, not exactly dinner time. vespa had been wanting to see Tiberina Island, so we walked along the shady, tree-lined riverway until meeting the tiny little island. 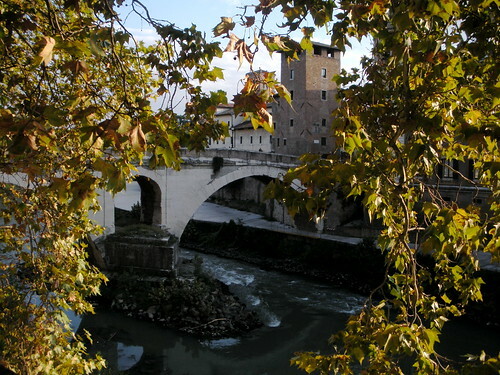 We crossed the ancient bridge and found a lovely old church there, San Bartolomeo all’Isola. 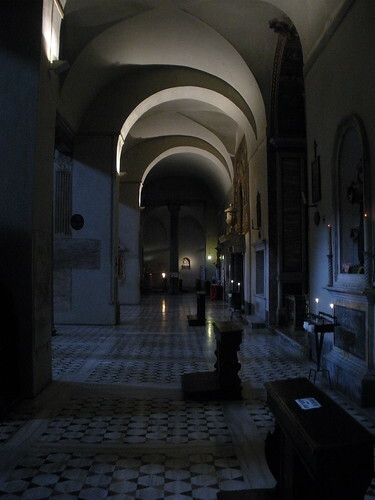 The church provided a welcome, quiet spot to rest and contemplate for a while, before crossing over into Trastevere to explore and find a dinner spot. Trastavere, once known as THE dining spot in all of Rome, has apparently slowing become more and more touristy (and less fabulous) through the years. Indeed, while the lovely streets are filled with restaurants, many offer the same repetitive choices and menu turisticos, which generally are signs that lead me to rule out a place as offering genuine good food (another telltale warning: restaurants that have to put photos of the food on their menus. Never a good sign…) We wandered and wandered until stumbling across tiny “Aristocampo”, which had a blackboard outside proclaiming “We are against War and the Tourist Menu!” On that alone I knew we had to eat there! It ended up being an excellent choice. While a little pricier than their nearby competition, Aristocampo had a great menu of some more unusual as well as expected choices and everything was excellent. 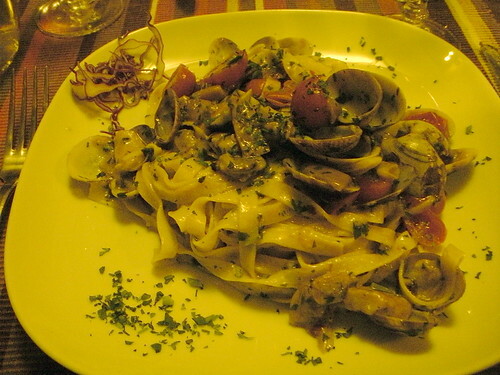 Dining under hanging Chianti bottles, we enjoyed eggplant involtini and pecorino romano with fig jelly to start; wonderful pastas and then whole fish in “crazy water” for vespa and pork saltimbocca for me. YUM! 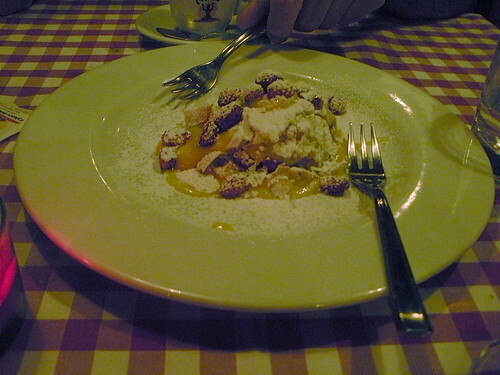 Dessert was an amazing lemon custard crumble dotted with dried raspberries and powdered sugar, and a VERY generous pour of grappa. We slept in late, finally needing some good rest after the long trip and a very full first day. Heading out around noonish, we wandered past the closed shops of Via Barberini and stopped in a little place for a panini “brunch”. Our eventual destination was Santa Maria Maggiore, but on the way there we got distracted by a couple other small churches and the imposing sight of Santa Maria degli Angeli e dei Martiri, which vespa had never seen before. 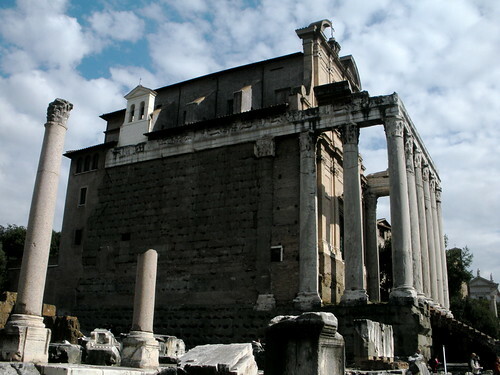 This beautiful and imposing church is built in the ruins of the Baths of Diocletian, creating a fascinating mixture of Roman ruins outside and classical art inside. The church was an amazing mixture of religion and science as well, featuring an exhibit on Gallileo and also an amazing Meridian line, sunlight shining through a small hole in the upper wall. I’m amazed Dan Brown hasn’t worked this one into one of his books yet. We discovered we were right near the National Museum of Rome at Palazzo Massimo, which proved well worth about a 2-hour visit, especially for the frescoes and mosaic artwork. 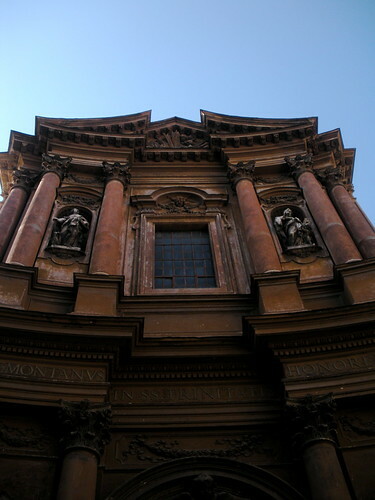 From there we finally made it to Santa Maria Maggiore, one of Rome’s other very large, very important churches. 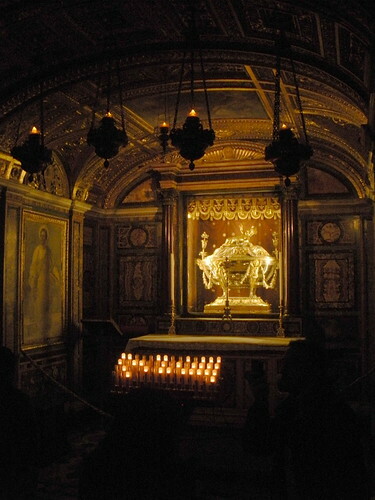 The lovely crypt was open and featured a supposed relic from the nativity. Who can say for sure whether it is or not? 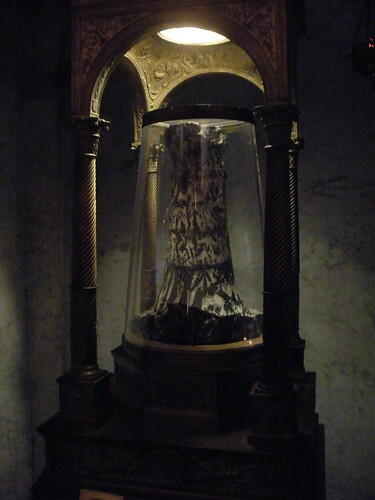 But one cannot help but feel the weight of importance attached to the relic, nevertheless. After wandering through the church, we took a quick pit stop for food-truck gelato (still damned good) and debated further plans. 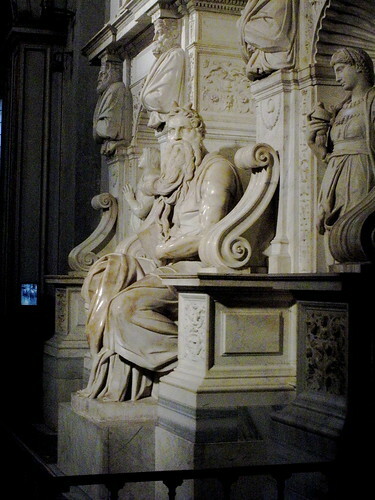 It was getting late and vespa didn’t want me to miss Saint Peter in Chains and Michelangelo’s sculpture of Moses. 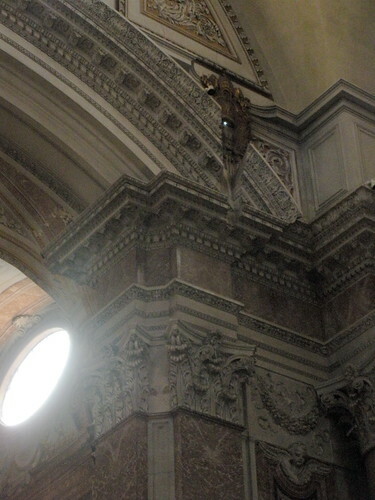 Of course, along the way we got distracted by a couple other small churches en route, including Santa Prassede, which had some gorgeous frescoes on the walls, and another alleged relic, The Column of the Flagellation. 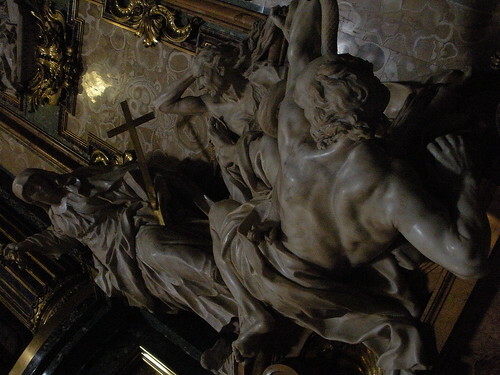 We finally made it to Saint Peter in Chains in time to check out the magnificent sculpture, as well as pay respect to some more relics–this time the chains which give the church its name. 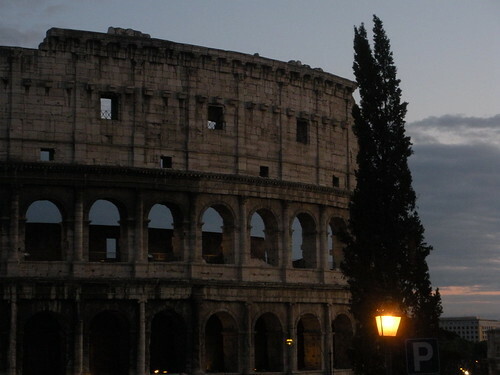 vespa knew I really was eager to see the Coliseum, and we managed to make it just as the sun was beginning to set–what an amazing time to be there! We walked around the periphery as dusk turned to night, marveling over the effect of darkness and artificial light on the building. …flight was mostly tolerable though as usual I managed to get no sleep, but at least some moderate rest thanks to my new Skyrest Travel Pillow. vespa kept teasing me about it, but I love the damned thing. We got into Rome about 8am, and despite numerous warnings in the travel books vespa STILL almost got conned by one of the roving “cab for hire” guys in the airport. Every book warns you to NOT use these guys but to go outside to the line of licensed taxis waiting right out front. It still cost us a pretty Euro, but vespa’s not so much for public transit and I was too tired to figure it out with all of our luggage. Plus, we got a pretty nifty drive into town, getting to see a few sights along the way. Our rental apartment was in an 18th century building on Via Ludovisi, just off Via Veneto and below the Borghese Gardens. We were greeted at the building’s imposing wooden doors by the owner of our apartment, a sweet elderly Italian woman who only spoke the barest minimum of English. With my barest minimum of Italian and a lot of hand waving, we were able to make our way up the ancient elevator and follow her instructions on how to operate most of the functions of our unit (although it took us four days to figure out how to turn on the hot water heater). 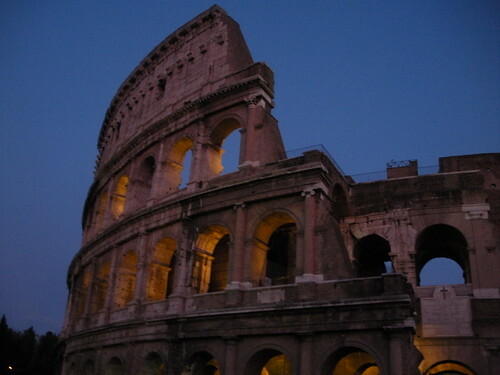 I’ll give a good recommendation to Sleep In Italy if you’re looking for a rental apartment in Rome, which is a harder market to find one in at affordable rates than others. It ended up costing us 835 Euros for 8 nights for a lovely spacious unit, much more affordable and comfortable than any hotel in the area would have been. It was about 10am once we got settled in, and while we debated taking a brief cat nap we were both too excited and ready to head out and see the sights. Vespa wanted to give me the whirlwind tour of the big sights near where we were at, so we started by tracking down the Capuchin Crypts at Santa Maria Concezione, right near our hotel. This crypt, built from the bones and skeletons of thousands of monks. Some might find it gruesome; I found it oddly beautiful and of course vespa was quick to identify hip bones, shoulder bones, foot bones, and every other type of bone that made up the chandeliers, ceiling and wall decorations. 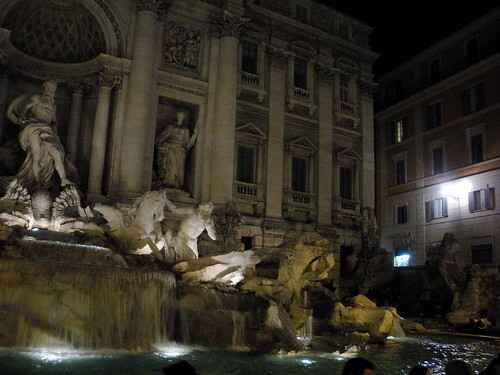 And yes, welcome to Rome. I can’t think of a place in America where you could find a sight like this. 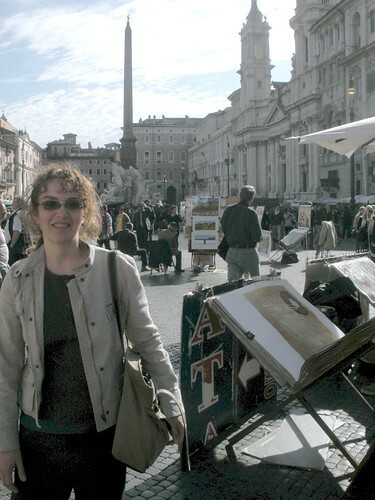 From there, we wandered down to Piazza Barberini and the Triton Fountain, and then from there to the Spanish Steps for some good views of the city and massive throngs of humanity. 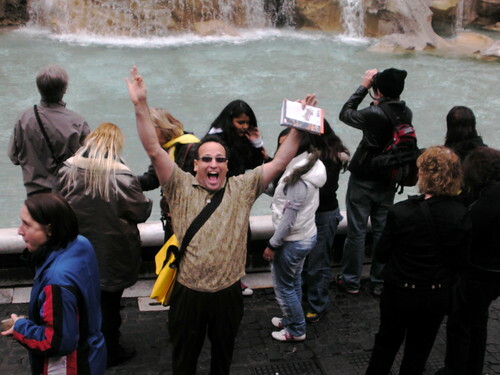 We walked down the steps and from there headed over to the Trevi Fountain, to do the necessary coin toss over the shoulder. We were getting pretty hungry by this point, so time to find some food. 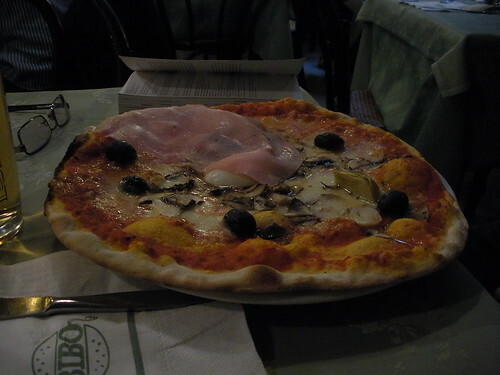 I have a rule in Italy about not eating anywhere too close to the main tourist attractions (as they all tend to be overpriced tourist traps), so we wandered about until we found a little place, Bibo, for our first taste of REAL pizza since our visit to Venice. YUM!!!! After food, and a mandatory visit to the Pantheon (paying respects at Raphael’s tomb and just gawking in general) we wandered over to Piazza Venezia (after hitting some churches to check out the artwork) and ended up stumbling onto some kind of protest on the steps of the Vittrio Emanuele II Monument. 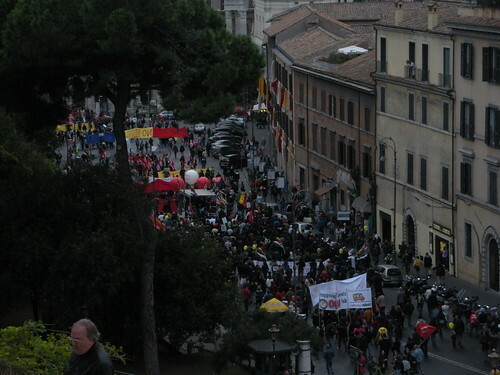 What they were protesting, not even the Carabinieri seemed to know. When vespa asked, one just shrugged and said “every week like this”. So we climbed the steps and watched for a while, went in another church, and then tried to find our way out of the mess. 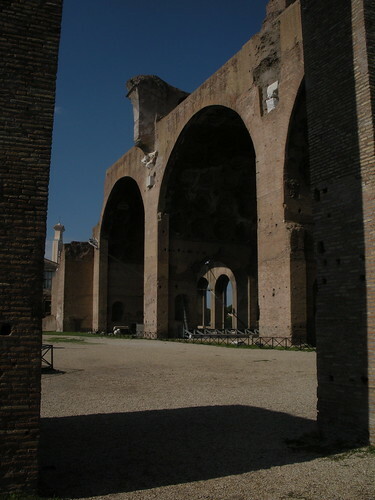 This lead us down to the ruins of the Temple of Apollo, on the edge of the old Jewish Ghetto. I took a ton of photos. I was also getting extremely exhausted by now after over 24 hours with no sleep and about 2 miles of walking. 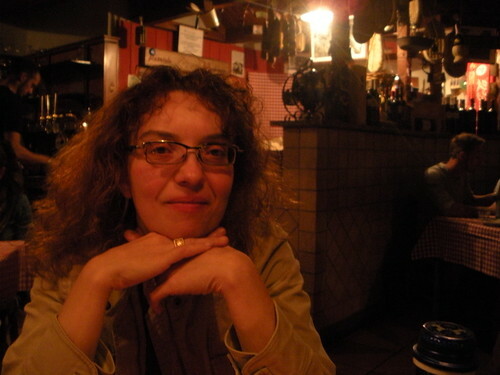 We shared a lovely plate of mixed vegetable antipasti and vespa had a bowl of straciatella. I had the house Risotto alla gioia (Rice with cream, peas, ham and mushroom) – some of the best risotto I’ve ever tasted – and vespa had (if I remember correctly) the Spaghetti alla amatriciana and Filetto alla cognac. I had been warned that finding good food in Rome would be a challenge, but if our first day was any indication, I had a feeling we were off to a very good start. Proposals and scripts for an A-Team movie have been going around for over a decade, but now it finally looks like it’s going to happen for real. The main cast seems set: Liam Neeson taking over George Peppard‘s role as Hannibal Smith; Bradley Cooper in Dirk Bennedict‘s role of Templeton Peck; Quinton “Rampage” Jackson in Mr. T‘s role of B.A. Baracus, and now Sharlto Copley in Dwight Schultz‘s role of H.M. Murdock. Jessica Biel is also apparently in the cast as an ex-fiance of Peck now hunting the team, and Watchmen‘s Patrick Wilson will play a CIA operative on the hunt for the team. The story and characters will be updated so that they will be Iraq War veterans instead of Vietnam vets; what else will change or stay the same remains to be seen, though early pictures show an A-Team van much like the original’s. As a die-hard A-Team fan for many decades, my feelings about the project have been mixed from the start. I read an early script for the project back in the 1990s which was truly dreadful, bearing virtually no resemblance to the characters and tone of the original series. But at this point I have to admit to at least a little curiosity of what will come about now that the film is genuinely going to happen, with an expected release date of June 11, 2010. I’m a big fan of Liam Neeson, although I don’t quite see him as Hannibal Smith without some major changes to the character. Murdock was always my favorite character so I’ve always been highly resistant to the idea of anyone other than Dwight Schultz in the role (Jim Carrey was long a rumor, but apparently “too expensive” for the project and I’m glad for that). Yet Sharlto Copley seems like a potentially good choice based on what I’ve seen of him so far after his breakout performance in District 9. That said, a lot of the longtime A-Team fans I know are decidedly not enthusiastic about the project, no matter who is cast in the roles because it won’t be the team they know and love. If the film is successful – which of course is no guaranty – I’ll be curious about the effect on the fandom, which has been steadily chugging along for decades with a low profile but fairly continual stream of fanworks production. Will there be a separate fandom that develops for these new interpretations of the old characters, much as what happened with the Star Trek movie this year? Will the popular slash pairings change or be the same (if there are any slash pairings that take off?) Will there be conflict between the new and old fandom, or will the old fandom try to capitalize on the newfound interest in the A-Team and try to welcome new fans in to explore the world of the original series? It should be interesting to see, and l’ll be following news about the new film with great interest as it develops. Yesterday I posted my report on the Dirk Benedict & Dwight Schultz panel at Dragon*Con. This is my day-by-day summary of the convention as a whole. For once, vespapod and I were leaving early enough that I could hopefully get some dealer’s room and artshow set-up done today. Our plans, however, were nearly thwarted when the radiator in his car went BOOM on the way to the airport! Fortunately we had time to spare to get the tow truck to pick up the car, catch a cab, and not miss our original flight. We arrived in Atlanta about 2pm, got our bags, got on MARTA, and headed straight to the Marriott Marquis so I could begin dealer’s room setup. My annual, lovely neighbors, Chimera Publishing, had a surprise for me since I’d gotten there early: an extra table! We had to squeeze it in “L”-ways in my table space, but I was hopeful that the additional display area would be beneficial to sales. I did basic set-up and then went to check into my hotel, the Wyndham, where I’d scored a room through the great dragonconrooms community at the last minute. 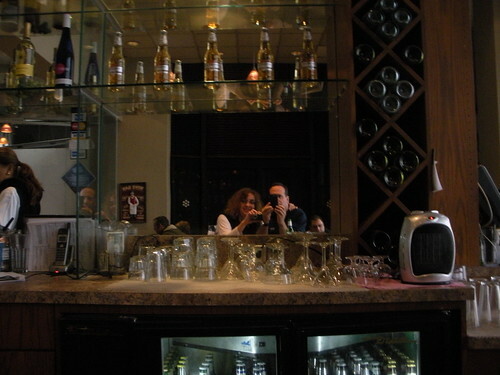 We still had some time to kill before art show set-up would begin, so we headed out for an early dinner at Benihannas. The place is usually too packed to even try to get in once the con officially begins, so it was nice having a chance to have a pleasant dinner before the crowds descended. On our way to the Hyatt, we saw that the registration line was not just out the door at the Sheraton, but stretched well around two blocks! Afterwards I heard that people stood in line for upwards of three hours to get their badges, and the line was even closed early Thursday so some folks had to get right back in it Friday morning. A friend of mine commented that it was far easier to just pay the extra money at the con to buy her badge than to preregister – that the on-site pay line was only about a half-hour long. Me, I’m glad for my dealer’s passes: no lines, no waits, just show up on-site and get my badges! How easy is that? Vespa helped me with artshow set up and by that point we were done for the night. It had been a long, stressful day, so we headed back to our hotel, had a couple drinks at the bar, and then called it a day. For once I didn’t have to get up at the crack of dawn to do table set-up, so we had a leisurely breakfast at the hotel and got back to the Marriott about 10am to finish my table set-up. I was pleased with how much I was able to get out on display with my extra space, and was well ready for the room to open up at 1pm. vespa had a panel to go to right at 1pm, which was fine as Friday sales are usually pretty slow. This definitely proved to be the case: lots of crowds roaming through, but most people were just looking, perhaps mentally making notes on what they would like to come back for later (if they had the money after buying photo sessions and autographs.) vespa returned and then I left for the Dirk & Dwight panel, as described previously. The room closed at 7pm. My numbers were a little low compared to Friday’s for last year, but I was still optimistic. I met up with a friend and we all had dinner together at Azio, a pretty decent (if pricey) Italian place, and then crawled the Marriott, checking out the costumes, posing for photos with everyone from R2-D2 to Jack Sparrow, and then hanging out at the Marriott bar until exhaustion took over. Saturday came and I was hoping for big sales – last year it was my best single day of the con. Unfortunately, this year it would be my single worst day. The dealers room was quite often dead, and what people who were there didn’t seem to have much money to spend. I talked to a couple other dealers who were experiencing the same thing, although some others seemed to be doing ok. After talking to some friends and other folks, though, we decided that the slow sales were perhaps due not just to the slow economy but the huge amounts of money people were paying for autographs and photo sessions with the three main guests this year: William Shatner, Leonard Nimoy and Patrick Stewart. It was $200 to get a photo with Patrick – and that’s before getting an autograph on it, too! I know a lot of people were balking about these prices before the con, saying they weren’t going to pay it, that it was unfair…and yet, the lines were continually back out on the street for their photosessions and I know a lot of people who DID pay the price. And stand in hours-long lines after lines not just for the photos, but then to see these guests in their panels. So I really think that all contributed to the slower sales for dealers. It’s kind of a Catch 22: you want big name guests to draw attendees to the event, and yet if they are TOO popular and their autographs TOO in demand, those numbers don’t necessarily translate into better sales for the vendors. At the end of sales hours I was feeling pretty bummed out, for certain. vespa and I had dinner on our own at a sushi place a little off the main track of foot traffic and spend a little while checking out costumes that night. But my heart wasn’t all that much in it at that point. I had paid and posed for an official shot with Dirk & Dwight that evening, so the one thing I was looking forward to on Sunday was seeing how my photo turned out! Sunday we got to the Marriott about 9am, as I was eager to pick up my photo which was supposed to be ready at that time. That was when I learned that Froggy, the guy who did the photo sessions, had had virtually all of his equipment stolen that night! The lock to the storage room had been broken and someone stole the camera equipment, AND the laptop with all of the photos stored on it. Fortunately, the Dirk and Dwight pics had been printed the night before, and the theives had not stolen any of the already printed pictures – whew! But I felt really bad for the folks who were now going to have to either get a refund or try to get their shots retaken, now would not receive digital copies they’d paid for, etc. Not fun, and given their system for tracking who asked for/paid for what is a little loose and confusing, I wonder how they actually managed to sort it all out. Still, my picture turned out really great so I was happy. After re-setting up for the day, vespa left to go to one of the Dukes of Hazzard panels, which he said was a lot of fun as there was only about 15 people there, so they could have a real conversation instead of a large group talk. I then headed out for a break from the table, debating whether I’d go to a wikipedia talk or to Dirk Benedict’s solo panel. On the way there, however, I was distracted by a woman in an AMAZING H.M. Murdock costume. Even more amazing, it turned out we were long-lost friends from our mutual days in Xena fandom. So instead of the wiki panel I ended up catching up with her for about a half hour. We then wandered into Dirk’s talk, but I have to confess I was getting a little bored after about a half hour and slipped out to head to the Walk of Fame and see if Dwight was there. He was, and I got my picture from the day before signed. This time we had a little more time to talk and I mentioned I was friends with John Glover, a former classmate of Dwight’s from Towson. That set off a really fun conversation. After that, I checked back at my dealer’s table – still pretty slow – so I went back to the Walk of Fame once Dirk’s panel was up so I could get his autograph on my photo as well. He commented on how much fun they were having during the photos and it definitely shows! After that was done, I pretty much stuck around my table save to hover in the artshow when bidding closed at 6pm. Sales there were ok – I moved about 2/3rd of the paintings I brought, even if mostly at minimum bid, and my mom did similar on her jewelry which I was agenting. Print shop sales were kind of slow for me, however. After that it was time to close the dealer’s room for the night. We met up with a local friend for a nice dinner at a nearby brewpub. After that, we were kind of too tired to do any more hotel crawling, so we called it an early night. Sales were still way down, though I was at least out of the red. I didn’t sleep that well, however, trying to scheme how to pull the con more into the black for me on the last day. Mondays are always crazy for me at Dragon*Con. First I had to rush over to the Art Show to get a check-out number at 9am. I got there early, which was a good thing as they started giving out numbers early as well. I would be 6th for checkout at 4pm, which was good. Got back to the dealer’s table and, once vespa was set up to handle sales, I had to run stand in the line to buy my table space for 2010.
vespa was ringing my cell yelling at me to get back as soon as I could. Sales were picking up, and to help that along we started doing some big discounts…30% off everything…it really helped even if it cut down on the profit per sale. With the push to move merchandise, at closing at 5pm (and combined with my art show sales), I estimated I was only down a couple hundred dollars from last year’s tally. Not great but I’d live with it. I got my stuff out of the art show and we did the mad pack-up, which took about 90 minutes. Made it to the airport with about three hours to spare before our flight. I was completely exhausted and so was vespa. It was a long, long weekend and it’s taken me a good three days after the fact to begin to feel back to normal at all. I always feel like Dragon*Con is an endurance race, and by the end I want to sleep for about a week solid. I also don’t want to see many human beings for a while either as the crowds get really, really old, really fast. Even so, we managed to have a pretty good time and I’m going to look forward to next year’s con. Though you might hear me hoping that next year, they won’t have such big name headlining guests…!